On one side monumental tumuli, giant rock-carved reliefs, altars and cave dwellings, on the other fairy chimney formations like works of art and the thermal springs that have warmed the lofty steppes of the Anatolian plateau for centuries. While wandering in the valleys and highlands, you grasp more easily the place in human history of the Phrygian civilization and its rich cultural heritage. 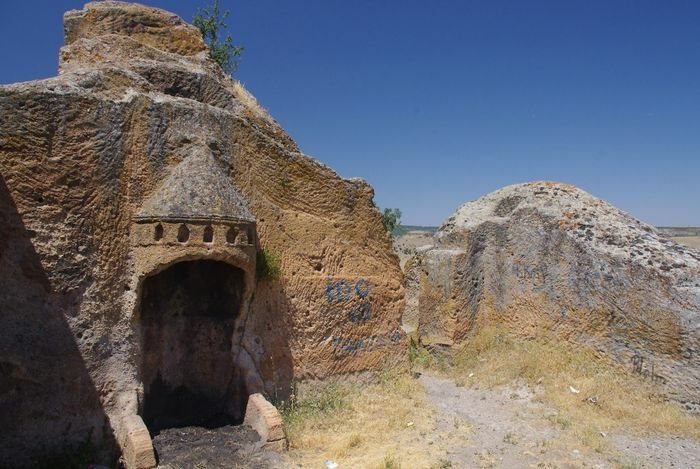 The region that includes the provinces of Afyonkarahisar, Kutahya and Eskisehir, where the monuments of the Phrygian civilization are located, is known today as the Valley of the Phrygians. Three cities still preserve their historic links with this magnificent geography, which illumines the present with the light of the past. Countless local riches, such as Afyonkarahisar’s marbles, Kutahya tiles and Eskisehir’s alabaster, are the touchstones of this cultural journey. Every day at dawn, first the castle perched on the colossal rock mass that rises behind it is illuminated at Afyonkarahisar. Then, spreading across the lower reaches of Afyonkarahisar Castle, the light reaches the historic texture of a house close to four hundred years old. This region, where you can find vestiges of traditional Afyonkarahisar life, is among the finest living examples of Anatolian civil architecture. Strolling about here, a person is astonished to encounter old-fashioned grocery stores with their characteristic smell that brings back childhood memories. Situated at the point of intersection of the inter-city highways to Istanbul, Ankara and Izmir, Afyonkarahisar is always alive and humming. The hotels and large shopping centers that have spread to the province keep the region ever vibrant. Like a virtual continuation today of the ancient trade routes, this junction and its dynamics are a major contributor to the city’s economy. Another city center exhibiting vestiges of history in the Phrygian Valley is Kutahya, which stands out for its mosques, baths, mausoleums, fountains, old mansions and museums. It is easier to get a handle on the city’s magnificent past on Germiyan Sokak, which is lined with old houses. You can also find rich examples of the local handicrafts all over the city. The pottery that dates all the way back to the Phrygians and the tiles that symbolize the city are among the branches of industry that contribute to the local economy. To understand the place where one lives and to appreciate its beauty, sometimes one has to look at it from another angle. To be able to say that one has seen Eskisehir, which could be considered the modem face of the Valley of the Phrygians, one should pay a brief visit to Kent (City) Park, which has been dubbed the ‘lungs ‘of Eskisehir, or survey the city’s skyline from Selale (Waterfall) Park. Watered by the Porsuk River, this progressive city is Anatolia’s rising star with its green cover, its transportation net that functions like clockwork, and its refreshing parks. Eskisehir also boasts a young and highly educated population, in which the university and its extensive campuses undoubtedly play the largest part. You’ll encounter young lovers on almost every street here, or students on an outing by gondola on the Porsuk, livening up the atmosphere with their cries of glee.